Welcome to the blog’s 400th post! It’s pretty terrific; I love the idea of using of simple animation to explore complex problems. We’ve been watching and discussing the programs all weekend, from an analysis of “illegal” immigration to do-it-yourself ribbon stickers to using elephants as weapons. The episode that I’ve been thinking about the most, however, is What’s Wrong With GMOs (Genetically Modified Organisms)? 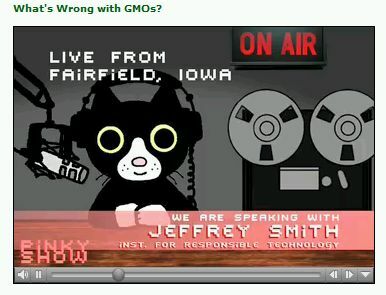 While this episode is a straight interview between Pinky and Jeffery Smith of the Institute for Responsible Technology, it’s one that discusses little-explored issues behind, and the potential effects on animals resulting from, GMOs. Many consumers in the US mistakenly believe that the FDA approves GM foods through rigorous, in-depth, long-term studies. In reality, the agency has absolutely no safety testing requirements. Pathetic research from companies like Monsanto who voluntarily perform on their own crops is meticulously designed to avoid finding problems. The reason for the FDA’s industry-friendly policy on GMOs is that the White House (under the first George Bush) ordered the agency to promote biotechnology and the person in charge of developing the policy was Monsanto’s former attorney, and later their vice president. That policy claimed that the agency was not aware of any information showing that GM crops were different “in any meaningful or uniform way,” and therefore didn’t need testing. But 44,000 FDA internal documents made public from a lawsuit show that this was a complete lie. The overwhelming consensus among the FDA’s own scientists was that GM foods were quite different and could lead to unpredictable and hard-to-detect allergens, toxins, new diseases and nutritional problems. They had urged superiors to require long-term studies, but were ignored. If you haven’t given much thought to GMOs, haven’t thought about it lately, or have received all your info on GMOs from the mainstream media, please listen to the Pinky Show interview as soon as you can. There is some uncertainty regarding the safety of genetically altered crops. Although foods can be engineered to improve nutritional content and increase pest resistance, doing so raises environmental and health issues. In Europe, all GMOs are assessed on a case-by-case basis. Some are banned as a result, and those that are approved are labeled accordingly. In the United States, where it is not mandatory to identify genetically modified ingredients, GMOs are prevalent in packaged products — especially those containing soy, corn, and wheat. Genetically altered fruits and vegetables are rare so you probably won’t find them at your market. To avoid them entirely, buy foods labeled “organic,” which can not be bioengineered. Or simply check your produce. According to the Produce Marketing Association, price lookup codes (PLU) — the number on stickers that are affixed to individual fruits and vegetables — can be used to identify the origin of produce. The standard PLU code is four digits, though some stickers feature a fifth digit that precedes the others. An 8 indicates that the fruit was genetically engineered; a 9 means the food is organic.